Royal Commission Survey of Cambridge 1959: House, no. 38, … of three storeys with basement, has walls of Gault brick and slate covered roof. In 1831 a sale advertisement described it as part of the estate of the late George Peacocke and ‘built … by the late William Wilkins Esq., architect, for his own occupation’ (Cambridge Chronicle 9 Dec). 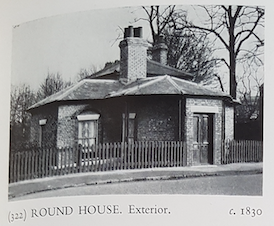 William Wilkins sen. (1751-1815) had built for himself Newnham Cottage by c. 1805 and the house may be assigned to the end of the 18th century. It is therefore an early example of a type of house usually associated with the Regency. … In the basement are ‘two capital kitchens’, on the first floor ‘ a noble drawing room, best bedroom adjoining, store room or china closet’, on the floor above ‘ four good rooms’. Herbert E Verrinder, Quartermaster-Lieut. 1st Battalion Cambs Regt.